One can't describe flavours without words. Words themselves, especially when they're compiled en masse into books, take on very distinct flavours of their own: delicious, bland, even rancid. Hence this blog, which explores Melbourne restaurants and cafes, as well as a range of literature, is a blend of passions for words and flavours. 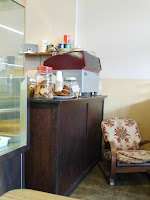 The minimalist refit is a favourite of many inner north cafes. At Each Peach, the walls display a little more flare than somewhere such as Small Block or Julio, and the reserve is saved for the menu. This is a cafe to stop in on a rainy day, when you want to feel at home but have someone bring warm things to you on a plate or in a glass; or somewhere to bask on a sunny day with light filling the front room as you ponder between paninis and their biscuit selection. The walls here are decorated with tea towels stitched into quilts; the front room is dominated by a hefty communal table perfect for spreading a newspaper on or resting your elbows as you become immersed in a novel (perhaps a book picked up from the cafe's bookshelf). Out the back there's a fire and subdued lighting, giving the room the feel of the loungeroom of a country relative. It's a good place for kids too, with toys and play area in both rooms. All this atmosphere would be wasted if the produce on offer didn't stand up to scrutiny. There's no problems there. 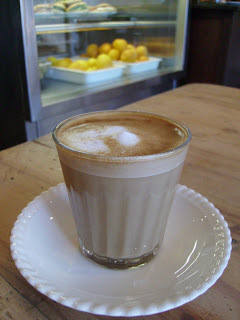 The staff at Each Peach know their way around a coffee machine and deliver a well-tempered drink. Just about everything served is organic (see right). 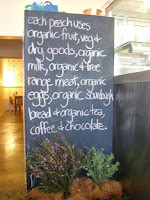 Choose from one slice or two of sourdough raisin toast or cinnamon toast with fig apple jam; or ask them to heat up one of the paninis on display, perhaps filled with goats cheese and olive tapenade, or biodynamic proscuitto, tomato and fetta; or tuck into a bowl of nourishing toasted muesli. Addendum: Having walked past Each Peach several times since they opened, I've been impressed to note how frequently they update their menu (a simple affair, chalked up on a blackboard on the wall). The panini fillings change regularly - there was a pork sausage and quince one last week, which I didn't act quickly enough to sample - as does a simple, cooked meal option. It's a great attitude to fresh produce and will keep curious palates sated. Curiousity will no doubt increase following Matt Preston's glowing review in Epicure, 12.08.08. Comments are always welcome, whether you're a regular or it's your first visit! Post thoughtful responses, quick reactions, agree or disagree, or suggest similar books and places.